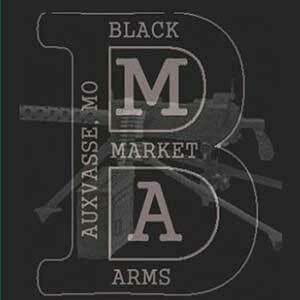 Black Market Arms (BMA), based in Auxvasse, Missouri came into existence because of the “Great Recession.” Until just more than six years ago, owner Ray Delashmutt had a prosperous flooring company. Then the housing market crashed. A firearms enthusiast and part-time gun shop employee who had squirreled away a lot of bargains over the years, Ray made the tough choice to start selling off portions of his own collection to pay bills. He knew about GunBroker.com from the buying side of the equation and saw the opportunity to start buying guns and flipping them for a profit. Encouraged by his success, he began looking for little niche markets where he could buy and resell “for $5 and $10 here and there,” Ray says. Then he began buying AR 15 detachable carry handles from China in bulk and selling them inexpensively for a small profit on each one. Ray reports “About 85 percent of our business is done on GunBroker.com; 10 percent over the phone or via email; and 5 percent is local, storefront business. So GunBroker.com really is our business. Efficient, economical transactions are critical to Black Market Arms success because of the volume of sales they do on GunBroker.com. They maintain between 1,600 and 2,200 listings active at all times. Taking the photos and writing the listings, Ray says, takes one full-time position to maintain that level of sales.